(LWI) - The Lutheran World Federation (LWF) General Secretary Rev. 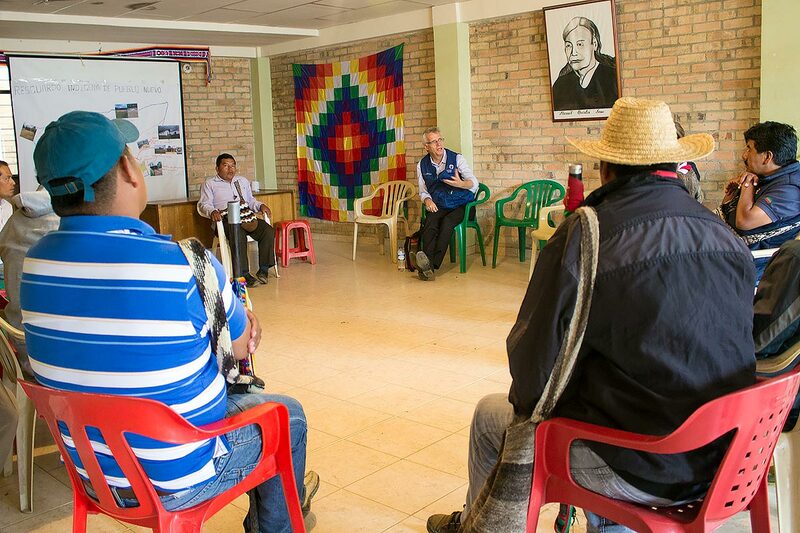 Dr Martin Junge has pledged continuing support for the indigenous people of Puebla Nuevo in Colombia as they integrate into their community former combatants in the country’s long civil conflict. Junge visited the indigenous reservation in Caldono, in the south western department of Cauca on 3 November. He held discussions with local leaders hosting the Territorial Spaces of Training and Reintegration (ETCR), where former guerrillas of the Revolutionary Armed Forces of Colombia (FARC) are making a transition to civilian life. He urged the community to continue resisting violence, expressing his commitment to communicate to the relevant authorities about both the achievements and obstacles in the implementation process while calling on them to broaden the peace process. The LWF General Secretary’s visit followed a long journey through the mountains of Cauca with members of the Interchurch Dialogue for Peace (DIPAZ), an organization the LWF supports through its World Service country program in Colombia. Established by churches and other faith-based organizations in the country, DIPAZ accompanies communities in the process of peace building and reconciliation through non-violent action. The LWF provides assistance for oversight of the peace accords’ implementation in the territories. DIPAZ is currently launching its second citizen monitoring report on the ambivalence of working toward peace. 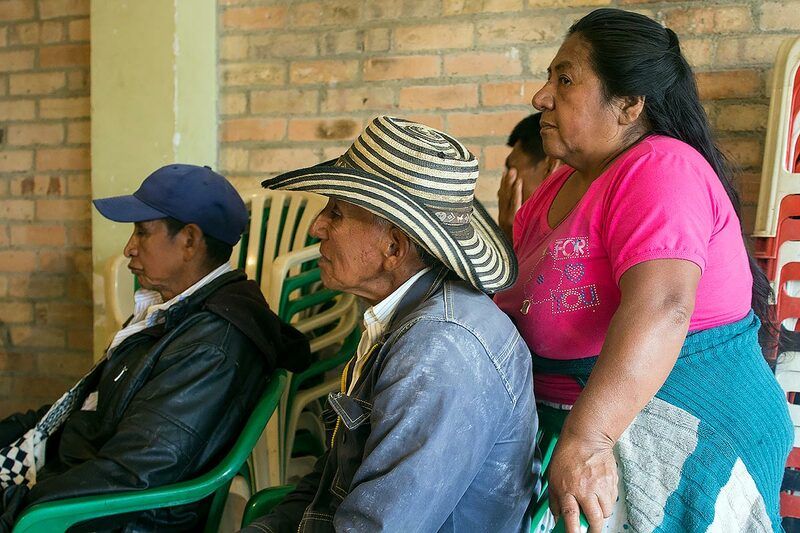 Junge met with pastors and indigenous leaders of the Caldono settlement, who explained the community is among those that have suffered the most from the impact of the armed conflict. They described the fundamental role that women and children played in resisting the violence of the war. “We got tired of the guerrilla attacks, and one day we decided to make a peaceful protest. We went from house to house and the women and children were the ones that were mostly present with sheets, tablecloths, napkins ... anything white that would help us to say that we were not going to be consumed by violence,” a local leader representing the victims of the conflict said. The leaders highlighted the role that churches have played in peaceful civil resistance and the reconstruction of the social fabric. “The faith of the churches helped us resist violence and stay together. The indigenous authorities are giving importance to the churches and together we are rebuilding the social fabric,” said one of the governors. The leaders expressed their full support for the peace agreement between the government and FARC in 2016, principally ending more than 50 years of fighting, and committing the signatory parties to participate in demilitarization and work toward land reforms including land rights. However, they were critical of the way the accord is being implemented directly in the regions. They told the LWF General Secretary of their consternation that the zones which are no longer occupied by the FARC group are being invaded by paramilitary groups, criminal gangs and other guerrillas groups. Despite these concerns and all the needs that have arisen, their messages were an endorsement of the agreement and a clear call for the joint construction of peace as the only and true way to have a peaceful country. “Peace must be built by ourselves, it's not something that comes from outside, we have to build it from our homes,” they concluded.